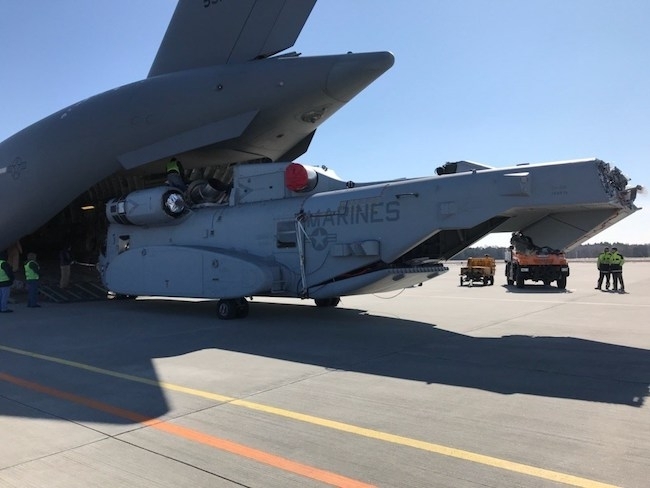 A CH-53K heavy lift helicopter built by Sikorsky has arrived in Holzdorf, Germany, ahead of its international debut at the ILA Berlin Air Show next month. This is the first time a King Stallion helicopter has been loaded into a C-17 Globemaster and transported to the base of a European ally. “We are excited for the opportunity to showcase the capabilities of this all new CH-53K heavy lift helicopter to an international audience. This is the only true heavy lift helicopter in production,” said Sikorsky President Dan Schultz. Sikorsky demonstrated the King Stallion’s strategic airlift capability during an exercise at the Sikorsky Development Flight Center in West Palm Beach, Florida, prior to the departure for Germany. A trained Sikorsky crew partially disassembled the CH-53K helicopter, loaded it into the C-17 cabin and then unloaded the helicopter while representatives from Naval Air Systems Command and the U.S. Marine Corps observed the exercise. As a result, the CH-53K program achieved its Air Transportability Test Loading Activity certification from the U.S. Air Force. The CH-53K King Stallion test program recently completed the following milestones: maximum weight single-point cargo hook sling load of 36,000 pounds (16,329 kilograms); forward flight speed of 200 knots; 60 degrees angle of bank turns; 12-degree slope landings and takeoffs; external load auto-jettison; and gunfire testing. These milestones come just weeks ahead of Sikorsky delivering the first CH-53K helicopter to the U.S. Marines. The helicopter will remain at the Holzdorf Air Base, a military airfield operated by the German Air Force (Luftwaffe), until the start of the ILA Berlin Air Show. The CH-53K will showcase its capabilities, maneuverability and advanced fly-by-wire technology during demonstration flights at the air show. The CH-53K aircraft is an all-new aircraft, using modern intelligent design. The rugged CH-53K is designed to ensure reliability, low maintenance, high availability and enhanced survivability in the most austere and remote forward operating bases. The CH-53K helicopter is the best choice for completing missions like humanitarian aid, troop transport, casualty evacuation, support of special operations forces, and combat search and rescue. No matter the mission, the aircraft will provide the highest degree of safety for its crew and occupants in all conditions.